This is my entry for Theme Thursday (Flying). This is a journal page I made from a photo of a red tail hawk in flight laid over aerial maps and the use of some nature stamps. 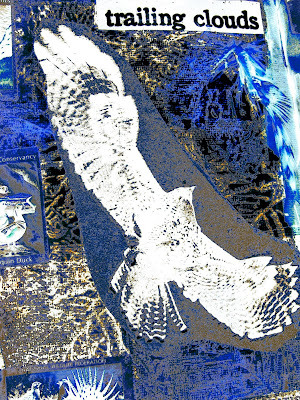 I inverted the photo for an ethereal look and artistic filters were added in Photoshop. 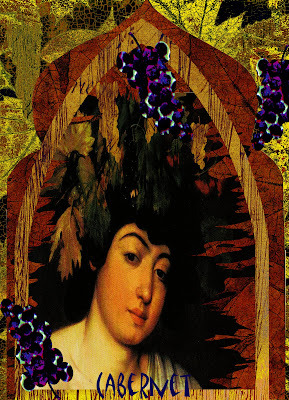 The theme at The Three Muses this week had me thinking about how I enjoy finding something old and making it new- giving the old item a new purpose or a new look. 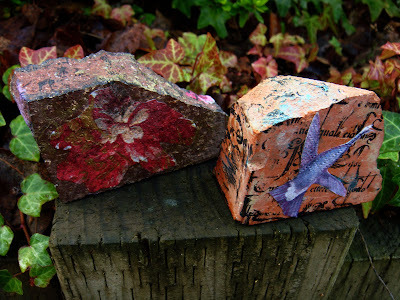 I found some very old brick pieces in my yard and decided to hand paint, rubber stamp and decoupage with (my decorative napkins again) and see what would happen. I saw a project like this in a Somerset Studio magazine some time ago and decided it was time to try it out. I love recycled art and was happy with these pieces. The same technique can be used with any masonry or decorative rock and used as an indoor or garden decoration. Totally fun! With the old year giving way to the new I plan to look for more things to alter and make new again, rather than just tossing away (New Year's resolution #1). This is my entry for The Three Muses challenge this week where the theme is "Home Sweet Home". This is another fabric journal entry done both by hand and digitally. I stamped on fabric (Catherine Moore- Character Constructions) the doll with house-shaped hat , scanned it and colored her digitally. 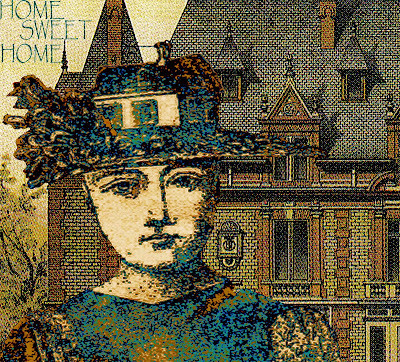 Background vintage Victorian house from (Dover). Added text and printed out again onto a finished fabric journal page to add to my book. This is my entry for the Sunday Postcard Art challenge this week which celebrates the upcoming Christmas holiday. 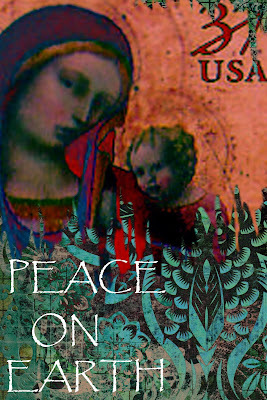 My digital postcard expresses my heartfelt feelings at this time of year- I wish peace to all and hope that the New Year will see progress towards a more understanding, tolerant and peaceful world. With our wondrous ways to communicate (blogging of course!) my world has grown so much bigger and more beautiful this year by the many new friends I have met through blogging from around the world. We really are all so much alike - and that is what I want to keep in my heart. Happy Holidays to all - no matter how you celebrate! 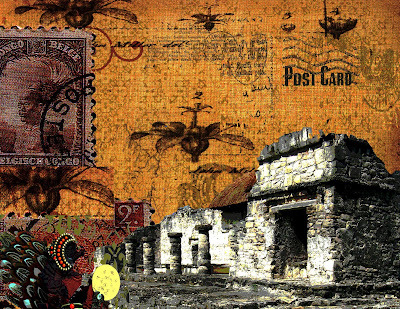 My digital postcard is made from artist papers by Marah Johnson, US Postal stamp, digital text and gradient artistic filters. 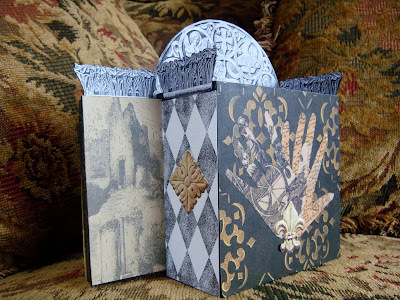 This is my entry for The Three Muses challenge this week which is "Mail Art", one of my favorite subjects which began years ago with Nick Bantocks' work ( "Griffin and Sabine"). Well, having just returned from my first cruise to the Carribbean I wanted to share this photo I took while on a shore excursion to the Mayan ruins at Tulum just off the Island of Cozumel, Mexico. A fascinating tour and for me the highlight of the trip was to view these ancient structures up close and experience their scale and symbolism. This is one of the ancient temples which I incorporated with a background of decorative artist paper (Rusty Pickle), faux postage from (Provo Craft) and the little clay figure I made a while ago which is a Mayan bird holding the sun -made from Fimo clay, beads and a gold jewelry disc. Artistic filters added in Photoshop. It's great to be back home, I missed my blog and am a bit out of sorts right now but hopefully I can catch up with all of the beautiful artworks I have missed and get ready for the Holidays! everything has its ebbs and flows. beneath the sea, everything is hers. 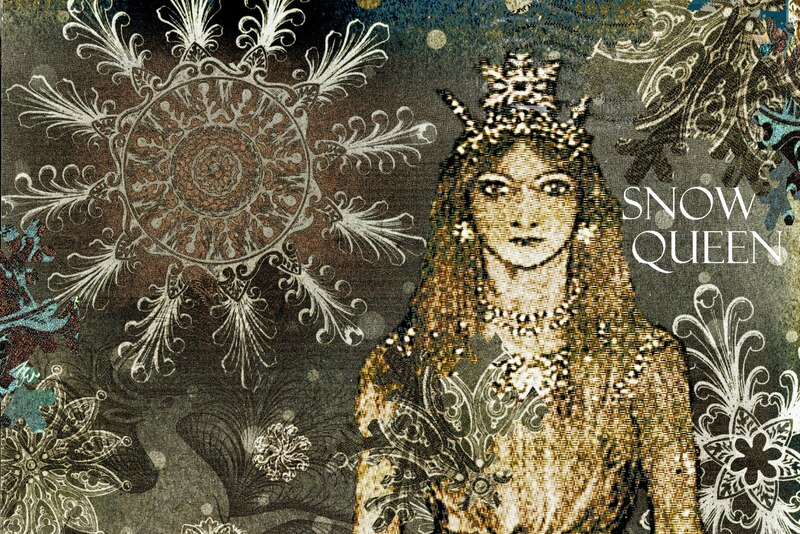 This is a digital collage I made to honor Samhain (Halloween) - the night when the veil between the worlds is at it's thinnest and the gateway when the old year ( now fully harvested ) and the new, must begin. 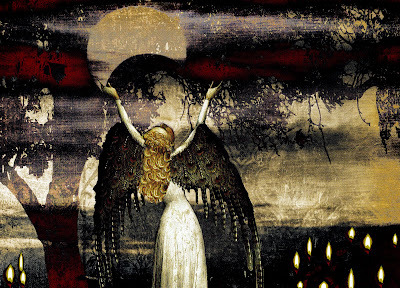 There is an eclipse as the goddess receives the moon's light and the candles are lit for those who have passed on. This is my entry for the Darkness Inspiration Challenge. 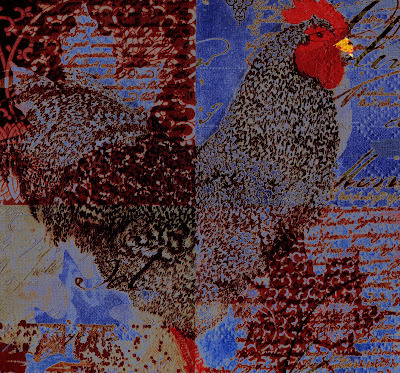 This is my entry for The Three Muses challenge this week (Chickens). My Rooster is a Coucou bleu (Holland Breed) . 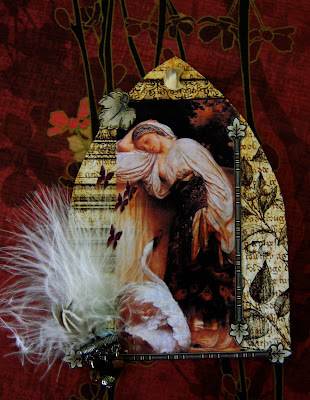 I blended the image over the background (artist paper-Creative imaginations- Christine Adolph), and used multi layers of coloring but tried to keep the feathering intact. I then added a 'Difference' gradient filter for a 'batik' look. There are an amazing number of beautiful breeds of chickens - I always enjoy going to the county fair here in the summer and being blown away by some incredible 'fancy 'breeds that you don't see on the common farm. This week I wanted to try and re-create a vintage type Halloween postcard for the SPA challenge. 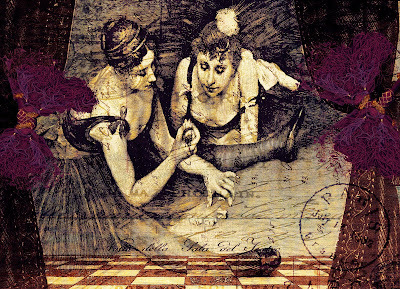 This is a digital collage made from artist papers (Christine Adolph) for the background, (Dover )copy-free clip art and 4 layers of color filters and textures in Photoshop. 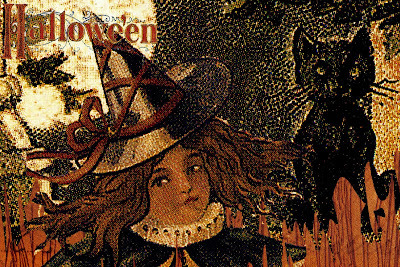 I digitally added the 'old' spelling of Hallowe'en . I love the revival these past few years of the old vintage Halloween art that is showing up in art and decorative items in the market. The newer things for sale can't compare. Happy Halloween to you all! This is my first entry for Theme Thursday "Faces" challenge. I had just finished this piece yesterday as I was working on creating a Vampire piece. 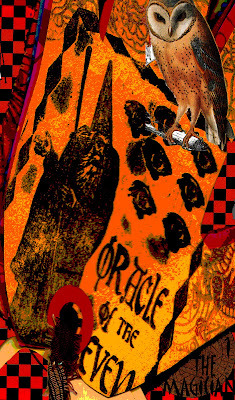 Old Goth meets high fashion digital collage! Mixed in Photoshop artistic filters/shadows added. This Vampire also works for the TGIF theme this week! really go further back or farther away than space! I layered a spiral galaxy onto a black canvas and used gradient coloring for depth. 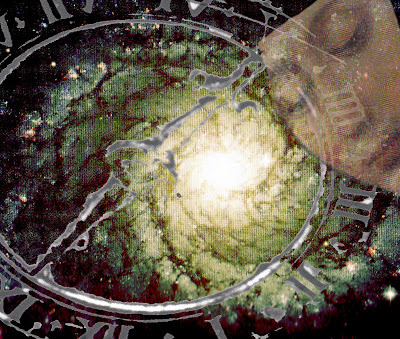 I know that time doesn't exist in space but I added the image of the old clock to represent looking back in time (as everything we see in space is from the past) through its portal, and the human face represents consciousness but not yet fully formed. This is my entry for dans ma maison il y a un papillon. 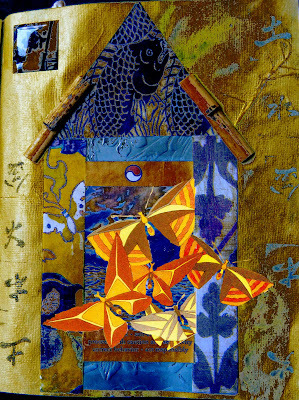 This is a hand painted journal page with a house made from assorted artist papers, rubber stamping , bamboo and mixed ephemera. The butterflys are from Dover, were cropped and placed as if exiting from the opening to freedom. 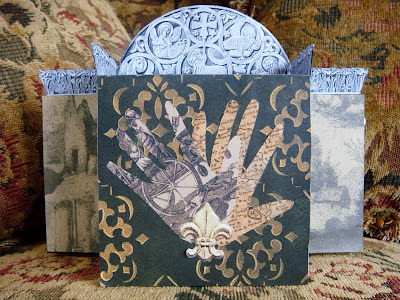 This is my entry for the Gothic Arches challenge this week "Ris-que". 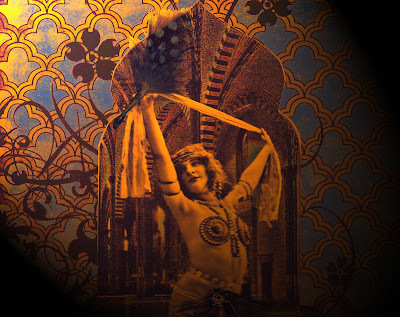 The image is from Luna Girl and the background is a photo of a vintage Moorish building. I added feathers and beads to the arch. 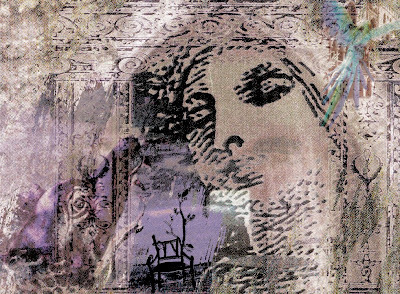 Background is from mixed artist papers layered and hued in Photoshop. I added a spotlight for an old photo quality. 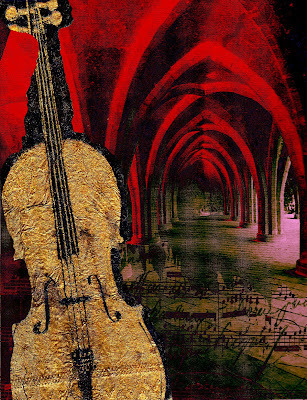 This is my 4x6 digital postcard for this week's theme at SPA "Gothic Grunge". 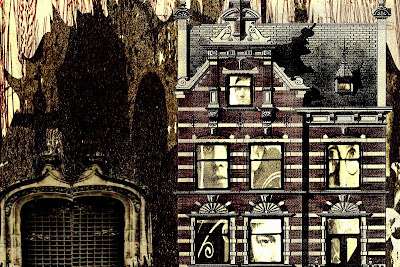 Grungey indeed with lots of shadows and spooky spirit faces peering through the windows! 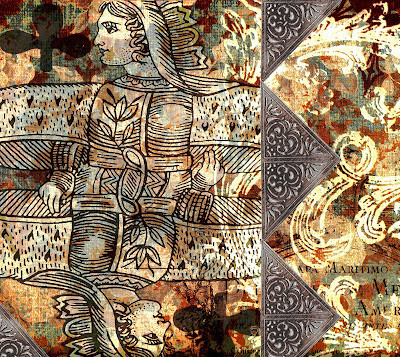 Dover images, artist papers, Artchix vellum all mixed in photoshop with artistic filters, (fresco, grain and gradients). As I write this post, the first storm has hit us here on the coast of California bringing lots of (needed) rain but wow this is more like the middle of January! It is however cozy and conducive to making some art. This is my entry for this week's challenge at The Three Muses - ( Hair). 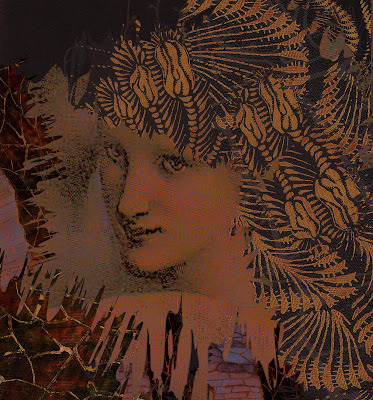 I made a digital collage using a face image from (Dover), assorted snips of artist paper and my maiden's hair is made from some antique fern images that I cropped, colored and arranged . Organic hairstyling! I added gradient filters for a "mossy" feel to the piece. This is my digital 4x6 postcard for the Sunday Postcard Art theme (Blackbird). Artist paper was used for the background with 3 different layer filters added. 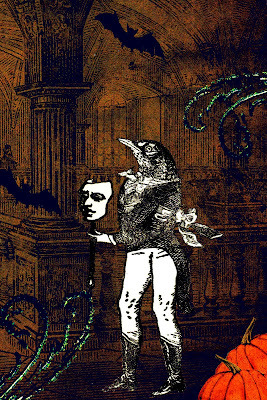 The blackbird and mask are rubber stamped images (Character Constructions) on white paper (background erased out). I added swirls , pumpkins and made bats digitally for fun! 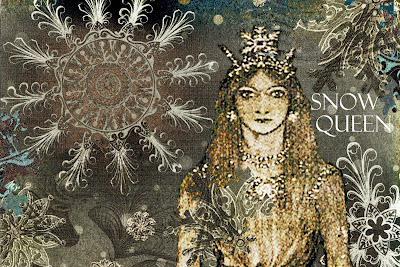 This is my entry for the SaWo challenge ATC 9'ners. 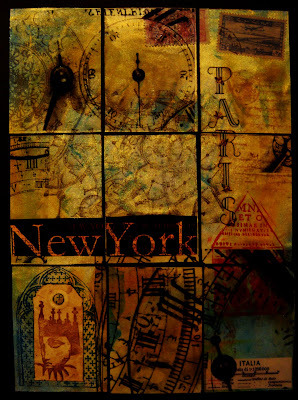 I used travel and time for my theme dividing it into 9 interconnected ATC's . Fantastic new challenge for me- I hope to work on some more! I was very excited to be asked to host Rosie and Linda's Big Art Adventure challenge this month where the theme is ( Make A Theater)! 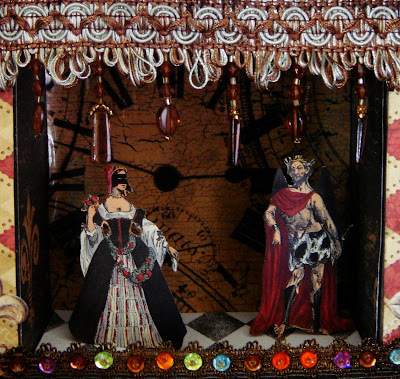 My inspiration for this piece came from both a love of paper dolls and all things Gothic. So I began by searching for wonderful artist papers and images that lent well to my theme. I used the box dimensions to trace and cut out the "wallpaper" so to speak. I took the cut pieces and spray glued them to the box dimensions - I like using the spray adhesive (like a photomount product) that goes on clean and stays tacky for a while. Once the paper is down; use a rolling brayer to remove any air bubbles. After all of the box surfaces were covered, I glued the removable doors to the side of the square box to create "wings" to the stage.To create the roof trim details I cut out Gothic designs and affixed them to heavy water color paper for sturdiness and glued along the perimeter of the box and wings. I supported these roof designs temporarily until they were dry. I then had fun adding trim (footlights), stickers and cut out my paper dolls (actors) and made a paper stand (attached to their backs) to make them stand up. 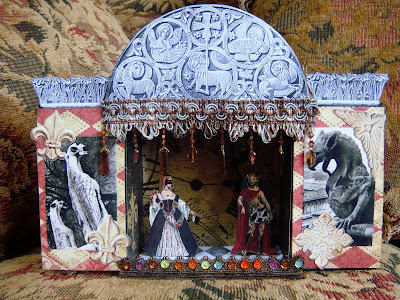 I totally had a blast making this theater and it was not too difficult as I had a stong idea of what I wanted to see. I went with a theme that appealed to me and used elements and techniques that I was familiar with. 1 6x6 unfinished wood craft box (with sliding removable doors-lid). Mine was from Ben Franklin Crafts. Assorted artist papers. Copy -free imagery scanned or copied to size. "Aleene's" spray tacky glue. "Jewel-it" clear fast-drying glue. Colored pens and pencils. Decorative trim, stickers. This is my entry for The Three Muses Challenge (Numerology). It depicts how numbers bring order and form to design and function in our lives. Numbers afford us balance and accountability in all that we do; paving the way for creativity to flourish. The background is made from ruler paper, over- layed with architectural renderings (artist papers). 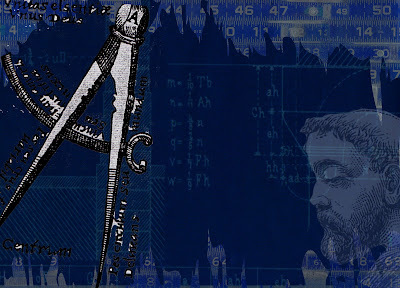 The scholar's face and compass are dover clip-art. I experimented with different artistic filters and then inverted the layers and added a gradient hue which gave the piece a "blueprint" look. 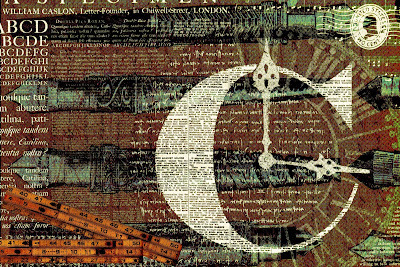 I'm still in a bit of a Zetti mode and decided to do a digital collage for the MMM theme "Maps". 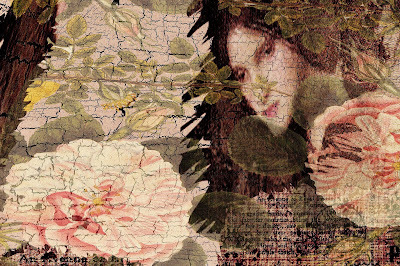 I used some antique maps for the background along with a vintage botanical palm tree image and Dover image for the face. 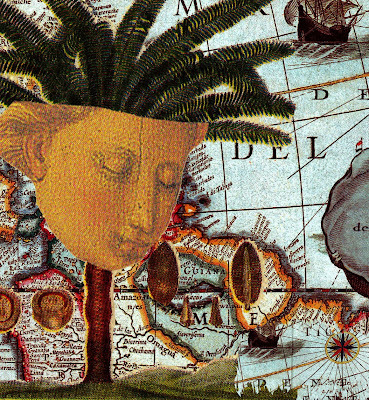 Dreaming of travel and maps (someplace tropical in mind) ! This is my digital 4x6 postcard for SPA ( Skulls and Skellies). I made it to resemble an old , stained Anatomy class type journal page. 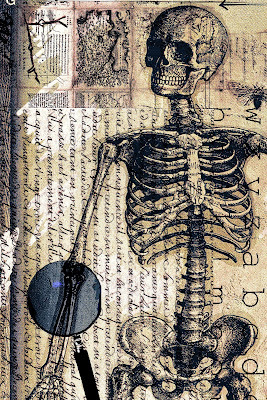 The background is made from scanned artist papers and an overlayed antique skeleton image. I then scanned in my magnifying glass and played around with the image until it became "see-through" as if to magnify the bone section. This is my entry for The Three Muses challenge this week ( Zlightly Zetti). This was a fun and experimental challenge for me (new to Zetti-style). The interesting part of the challenge for me was to create something in a very well known and recognizable style but still make it my own and represent what I like to do! 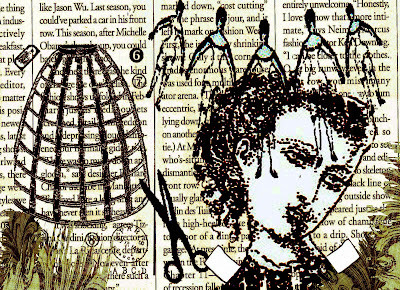 The background to this piece is a journal page made from decorative paper napkins and clipart. 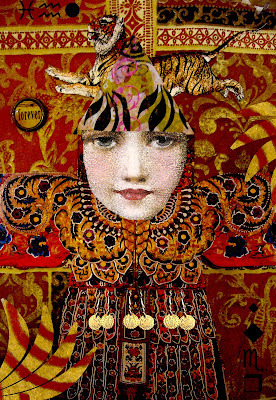 The face and Kimono images are from Dover. The symbols, hat, coins and Zetti swirls were added digitally. This is my Gothic Arches entry for the theme "Autumn". I love Autumn, and where I live in the wine country in California- nothing says it more beautifully than the grapevines in their full glory. The colors are fantastic just as the "crush" begins to happen in late September . I made this Gothic Arch with some of the colors and elements that symbolize this time. 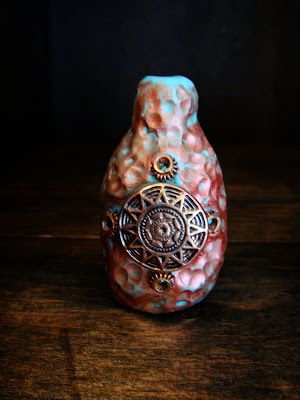 I wanted it to have the look of a wine bottle label which I love to collect! This is my postcard entry for SPA (Stripey Legs). 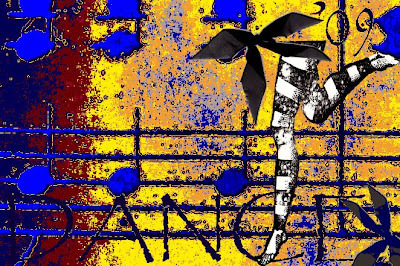 I decided to make a poster-type postcard this week using a great rubber stamp (Teesha Moore) , scanned and altered ribbon elements and the background is sheet music that I altered digitally. Digital text added. This is my entry for the SaWo theme. 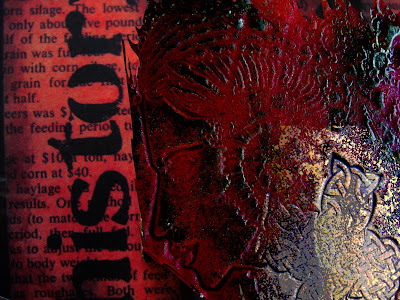 Artist papers were used for the background of this journal page and the woman and cross are Fimo clay pieces that I made that are finshed with alcohol inks and metallic pigments. When I first saw the prompt for this week's theme at The Three Muses (Windows) my mind went to that old proverb "The Eyes are the Window to the Soul". I googled the quote and had a hard time finding the author (the information runs from an old biblical reference to William Shakespeare) so I'm not sure- but I like it! 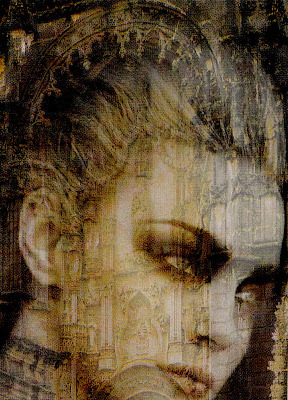 This is a digital collage made from a (Dover ) image , a personal photo of a window in my home with the sun coming in (erased out background) and a photo I took of an ornamental piece at Grace Cathedral (sky element). I added digital text and gradient filters. 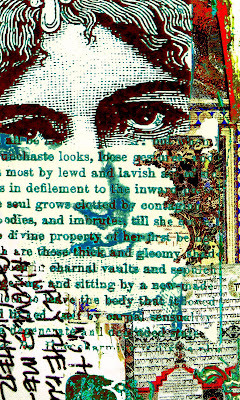 I have always been drawn to a person's eyes as an immediate (and I have been wrong) sense of their essence or nature. A downcast eye (shyness) or a bold square look into your eye (truthful, honesty) rings true most of the time. I think a lot of emotion and inner signals make themselves apparent through our eyes- a sort of window to our inner being. This is my entry for the MMM challenge (Metals). 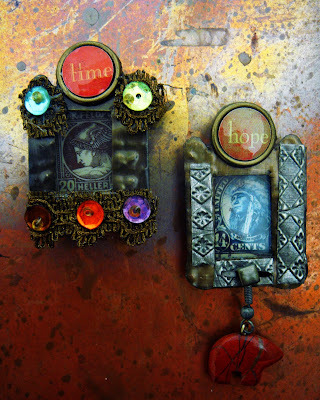 These are metal Nichos or shrines that I altered with paint, postage stamps and added bead embellishments and metal patinas. This is my entry for the Sunday Postcard Art challenge "Gypsies". 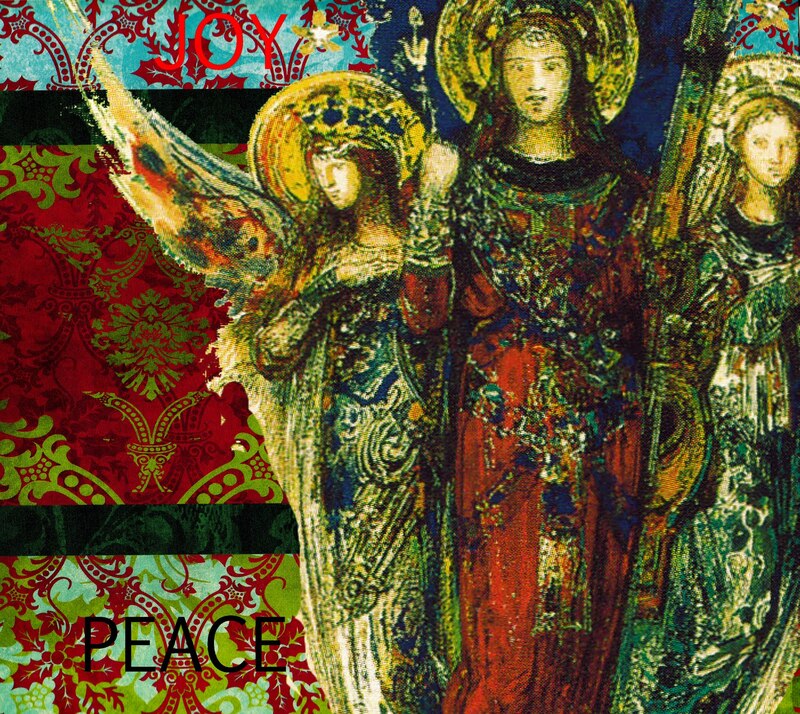 It is a digital 4x6 card made from assorted copy-free clip art and artist papers. I also included a couple of (fortune card)tags that I made. Digital layering and filters added. I have always been fascinated by the Gypsy lifestyle ( although I'm sure that the fascination is fueled by a very romantisized - Hollywood or book version rather than one based in reality). 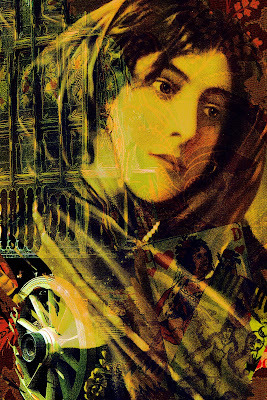 The fortune teller or seer was always portrayed as a wise and mysterious woman who read cards or gazed into a crystal to tell you your fortune (for a price , of course)! 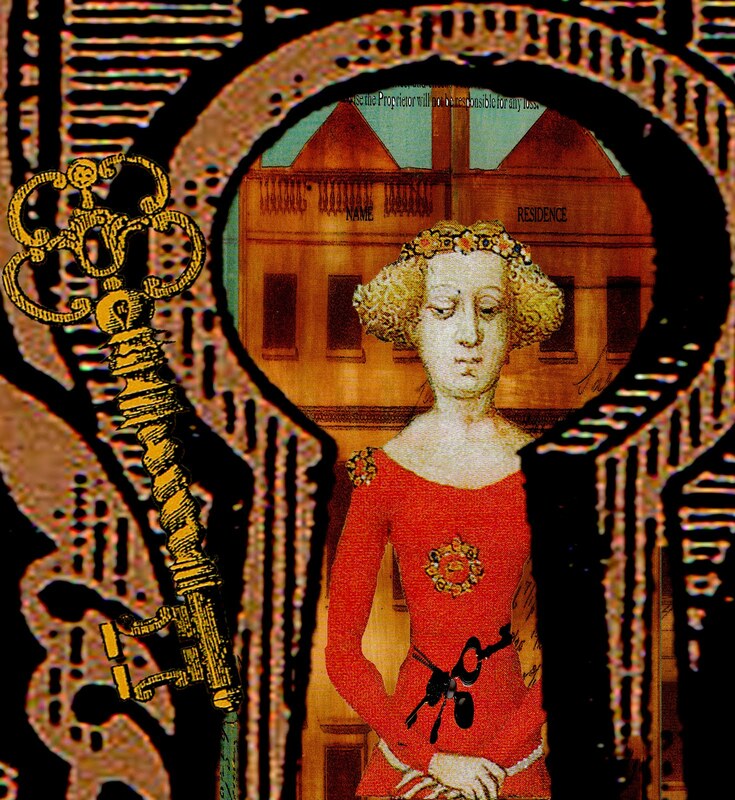 Having learned the Tarot myself I now realize that the best reading is one you do yourself- an intuitive, insightful exercise - that certainly can be aided by someone knowledgeable in the card meanings - but one who lets (you) give the cards their meaning and power. This is my entry for TGIF this week- the theme is Magic. 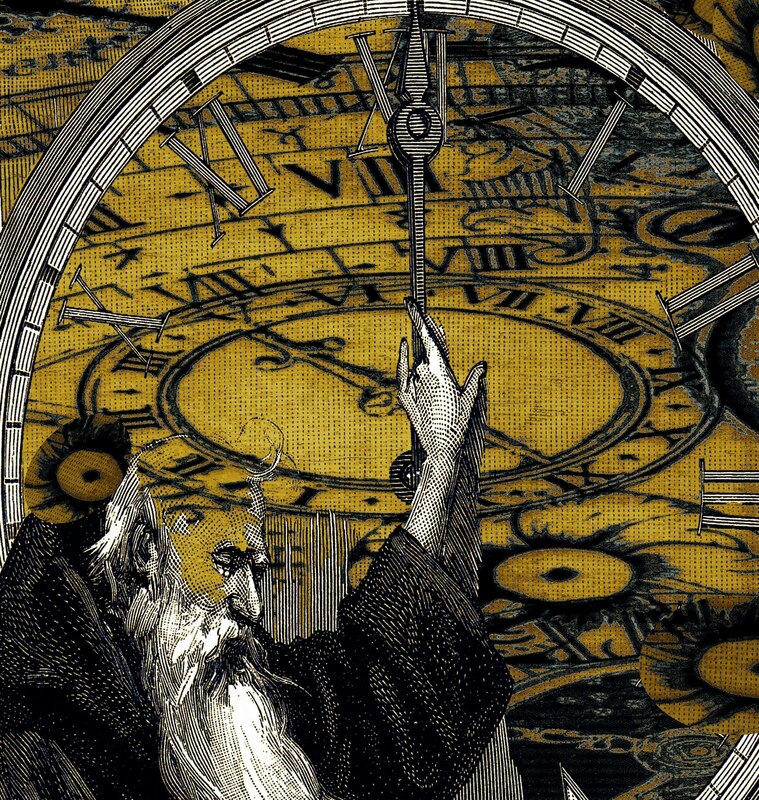 This is one of my digital Tarot Cards - The Magician (1). This is composed of art papers for the background and a tag that I made using(rubber stamping and hand painting) and then over layed. Assorted copy-free clip art and digital text was added. The Magician , follows the Fool in the major arcana and represents magic along our path. Any good magician knows that magic is fueled by intent and right desire along with the use of corresponding elements that align with the wanted outcome. We are all magicians when we set forth on our journey to achieve and by pulling all of our sources and knowledge and intent together for an expected outcome- magic happens and we get our desired results. I admit it. I own far too many pairs of jeans! Dress jeans, torn jeans, skinny jeans, fat jeans; yes I have them all. One of the things that I realized that attracted me to some of my jeans are their back pockets- which are often quite fancy and detailed. 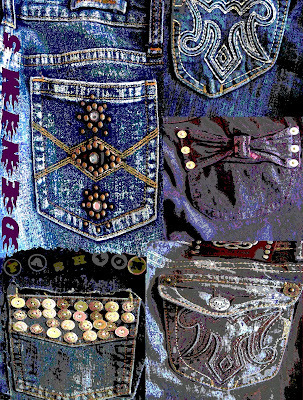 So, for The Three Muses challenge this week (Pockets) I took photos of the back pockets on 5 different pairs of my jeans and made a digital collage from them. I cropped, arranged and added artistic filters and some digital text for fun. Some day I may look back on this collage and wonder - how did I ever sit down! Such a slave to fashion! My husband and I built a home in 1992 on the Pacific coast in Mendocino California. It was a glorious setting and it was a vacation home for our family for about 9 years. I named it "The Sea Ghost". Among some of the antiques that we found in nearby Fort Bragg ( a quaint fishing and lumber industry town) to furnish the place was this old steamer trunk (above photo). I remember the musty smell inside but was really taken by the mystery that it held. 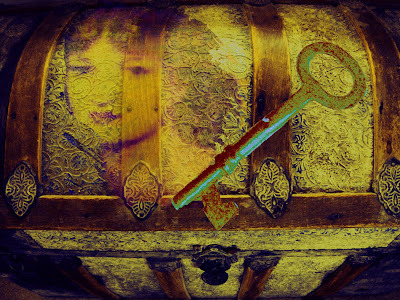 I now owned the Key to unlocking its hidden past, its travels, its prior owners. 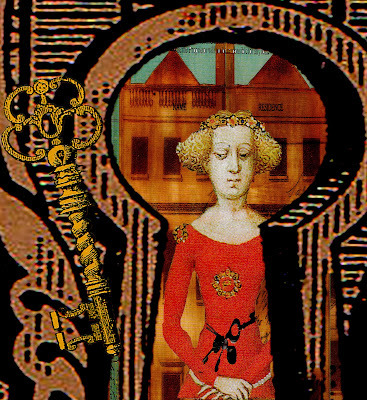 I decided to make a digital collage using my own photos for Rosie and Linda's Big Art Adventure in which the theme this time is "Key". A key is a powerful piece of hardware. It leads to joy, sometimes sorrow, and sometimes through a door of no return. It can answer long held questions and give insight to past times and perhaps even future ones. This is my entry for the TGIF theme (skull). 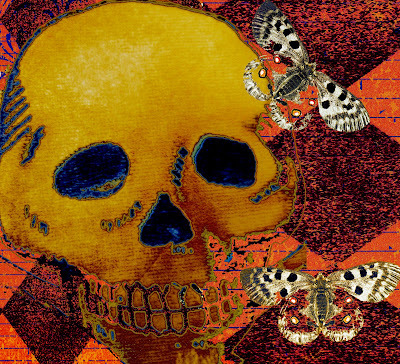 A digital collage made from a photo I took of a plaster skull which I then cropped, erased and painted digitally. Artist papers and butterfly images added. A little graffiti Halloween spirit! I do enjoy the romantic theme challenges! This is for The Three Muses this week - the theme being"Moonstruck". 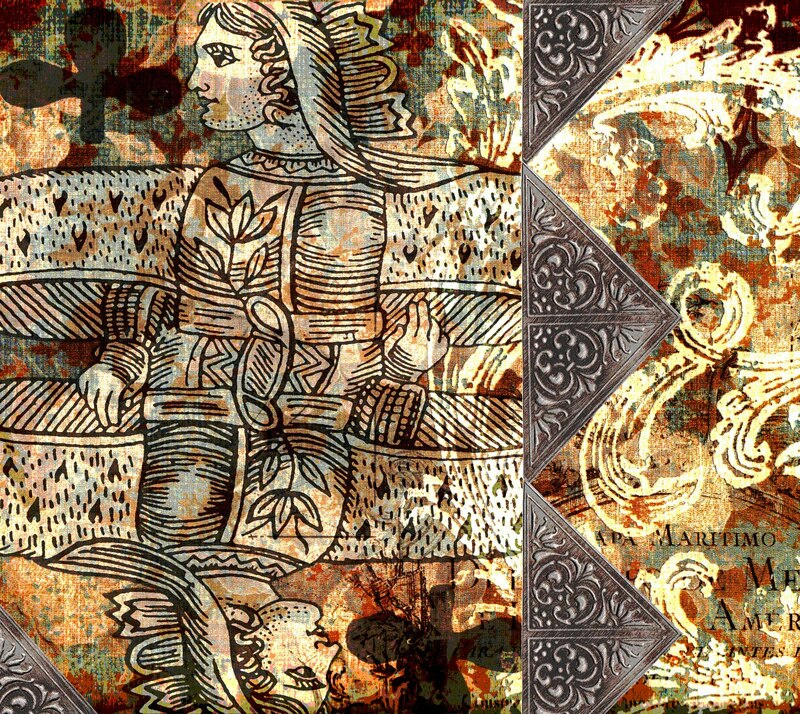 I built the background from 2 layers of artist papers then added cropped images (background erased and altered) on the woman and fern images. 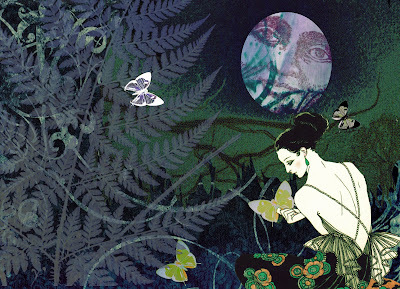 The rubber-stamped moon is from one of my journal pages and the butterflys I created digitally. Gradient filters added. Ah- Twilight or Dusk as some call it. That wonderful in-between time when the sun has just set behind the hills but you can still see enough to dream. Here in Northern California we are just entering late summer into fall (another in-between time) and the sunsets are amber in hue and long golden shadows spread over the landscape. Definately my favorite "Time of Day" and season to boot! 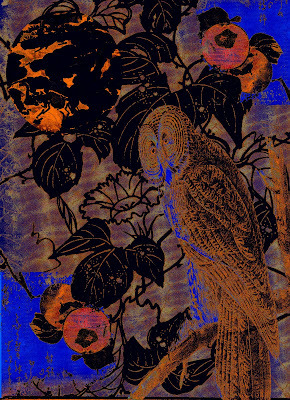 I made this digital collage for Mixed Media Monday and it represents twilight in my garden- where I am often visited by Barn Owls (some that I rehabilitated and released when I worked at Wildcare) and others looking to nest (I still have a nest box on my property). Twilight is a magical time for rest , reflection and connecting to the darkening world around us! Early September and school begins again. I always enjoyed starting back to school with all new pens, pencils, binders and organizers (things didn't stay organized for long!) ; looking forward to a new year of learning and new experiences. Looking back I was always very practical minded about the courses I took but wish now that I had taken more art classes or gone to Art School... On the other hand I think our art developes with time, out of what we know and learn reflecting who we are and what we have become. 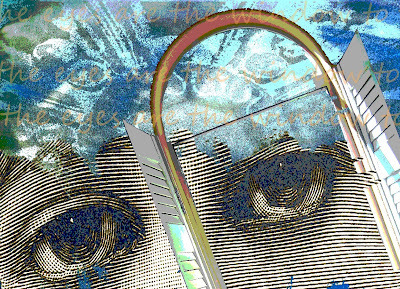 With Art School in mind, I made this digital collage for the Sunday Postcard Art Challenge "School".